A month ago, the Aged Care Guild began a campaign called “Protect Aussie aged care”. It launched a petition asking for signatures in a bid to pressure the government into providing more funding. How many people signed the petition not realising they were supporting some of the most profitable providers in the aged care industry? The Aged Care Guild represents the largest nine aged-care companies: BUPA, Japara, Regis, Estia, Allity, Arcare, McKenzie, Blue Cross and Opal. 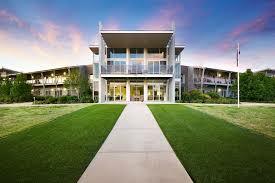 These companies are now the fastest-growing owners of aged care homes in Australia. According to their annual reports (2015-16), Japara made a profit of $30 million – up 5.6 per cent; and Estia $51.8 million – up 16 per cent. These large profits depend on substantial government subsidies. This campaign resembled “astroturfing” – although the campaign mimicked a grassroots movement, it was run by a highly paid lobby group. With the recent horror stories about the quality of care in residential aged care homes, including maggots being found in a resident’s mouth at an Opal aged care home, we need to feel reassured that government subsidies are used to improve the quality of life of residents, not go into the pockets of providers. In what can only be seen as bad news for older people across the country, the “industry” supposed to support and care for them is in trouble. Deep trouble. The signs are there for all to see. 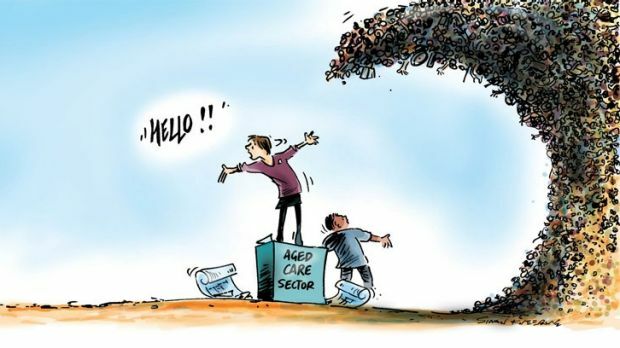 The handsomely government-subsidised aged-care industry model is set on a trajectory of decline. Residential aged care is big business. The Aged Care Financing Authority estimates the sector requires an investment of $31 billion over the next decade. Most of this will come from the private sector (The Age, 29/7). The bipartisan “Living longer living better” reforms have decreased regulation in aged-care homes. 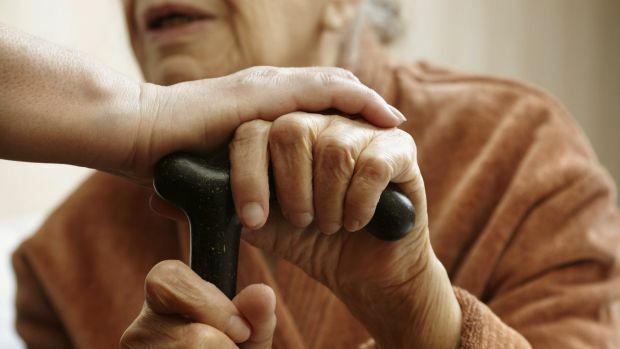 Vulnerable older people are now “consumers” in a market-based system. Deregulation serves the interests of providers, not residents. Paradoxically, private providers of aged-care homes lobby for a decrease in regulation and an increase in government subsidies. 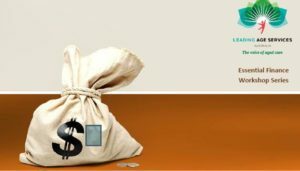 Leading Age Services Australia, the peak body representing private providers, is using images of “money bags” to promote their funding workshops to optimise government subsidies. This ad suggests that profits trump residents’ care. Recent calls for camera surveillance in aged-care homes divert the focus away from the need for systemic change. The care of vulnerable older Australians is too important to be traded on the market like any other commodity. Privately owned aged-care facilities have taken over from religious, community-based and charitable organisations, and the sector needs a shake-up. Language shapes our sense of place. Residential aged care facilities are places that our most vulnerable older people call home; the home that will, for most, be their last place on earth. The term “facility” dehumanises aged care. Facilities are built to perform functions in the most efficient manner. In contrast, a home is a welcoming place, where friends and family drop in for a cuppa or a chat, and, if we need help, assist us around the house, the garden or even with dressing. Since the 1990s successive governments have failed to heed the forecasts of demographers on population ageing. Now with the need for housing and care options exceeding the capacity of families and communities, an investment boom is taking place. Private equity firms, foreign investors and superannuation and property real estate investment trusts are entering the residential aged care market in larger numbers. And they are building larger facilities. According to the Australian Institute of Health and Welfare, half of all residential aged care facilities had more than 60 places in 2014 compared with 28per cent a decade ago. Increasingly built on reclaimed industrial land, aged care facilities now serve as places to warehouse our parents and grandparents, removed from daily community life. The Aged Care Financing Authority estimates the residential aged care sector requires $31 billion of investment over the next decade. Handy if this can come from private funds. To attract investors, the Productivity Commission recommends a competitive market with reduced regulation. In a recent letter to the editor (8/1), the chief executive of the Aged Care Guild listed “infrastructure, technology, and training and consumer choice” as the improvements “unleashed” on the sector. Care was not mentioned. Using language of facilities, scale efficiencies, corporatised operations and the generation of better margins enables investors, industry bodies and politicians to respond in solely economic terms, forgetting they are building a home where care is provided for us, our parents and grandparents. Policies seeking to improve care are bureaucratic and largely meaningless because they are based on the language of business facilities. While we need strong standards and monitoring of aged care services, we equally need to change the prevailing view of ageing, and what it means to provide a home and care. We need to include the broader moral view on the question of how we, as a community, can create an age-friendly environment for all. We hold deeply negative attitudes to ageing, lumping together all older people as a drain on the economy, separating them from the life span, and pitting them against the young for resources. Fearful of our own mortality, frailness and dependence on others, we stigmatise older people. While we respect those who can take care of themselves, or who are “not a bother to anyone”, those who are frail and needing care are not accorded the same respect. This equates to a failure to recognise our parents and grandparents as full human beings. Within aged care, these social views of old people as worthless and unproductive are reflected and magnified when faced with the daily reality of frail human bodies. When we treat people as “other”, when the stereotypes structure policies and culture, we treat people carelessly. We need a moral approach to the care of older people based on kindness. We need to recognise in older people an inner life much like ours; complex, full of memories, filled with desires, passions and vitality even if their bodies and minds are no longer as agile. There is a significance to late life. It has purpose. Its meanings need to be seen and celebrated. We need to shift our view of frail, older people to include the recognition of their contribution to our nation’s prosperity over the whole of their lives. We need to value the contribution people who need care can, and do, make to the lives of others. Everyone is responsible for the culture of ageing. We need effective leadership from governments, the private sector, businesses, families, community members and older people themselves. We need to create places where we can live the end of our lives as part of the community, in homes where we receive care with respect and kindness. Our sense of belonging is deeply rooted to our sense of place and purpose. We have a moral responsibility to create age-friendly places for all.